Ngwenya, S., Rampa, F. COMESA fully behind CAADP Vision 2025. GREAT insights Magazine, Volume 4, Issue 2. February/March 2015. The Malabo Declaration implementation strategy and roadmap is a key guiding document for realising the 2025 Vision on CAADP. The participation of all key stakeholders, not least of all Africa’s regional economic communities, will be crucial to ensuring its successful implementation. Francesco Rampa: How does COMESA intend to implement the Malabo Declaration implementation strategy and roadmap at the regional level? In particular, what concrete initiatives will COMESA undertake to promote the Malabo Declaration targets of tripling intra-African agricultural trade by 2025 and establishing and/or strengthening inclusive public-private partnerships for at least five priority agricultural commodity value chains with strong linkages to smallholder agriculture? Sindiso Ngwenya: As you are aware, the Common Market for Eastern and Southern Africa (COMESA) places immense importance on agriculture as a lead sector in our region’s integration agenda. COMESA’s overall mandate is to attain regional integration through trade and investment. Evidently, the mainstay of our economy as a region is agriculture. Therefore, trade and investment in agricultural products and services within and beyond the region is important for us. Increased production and productivity in the sector are also key. We see the private sector playing a critical role in advancing the growth of the agriculture sector and the economy in general. You recall that the 2014 African Union (AU) Assembly of Heads of State and Government in Malabo, Equatorial Guinea (following the AU declaration of 2014 as African Year of Agriculture and Food Security) enabled an evaluation of the achievements of the Comprehensive Africa Agriculture Development Programme (CAADP) for the past ten years. The Malabo Declaration (2014) represented a renewed commitment by our African leaders to the values and principles of CAADP, with emphasis on results and impact and reference to the CAADP Results Framework and CAADP Mutual Accountability Framework. We in COMESA are keen to contribute towards realising the ideals of the Malabo Declaration. It is for this reason that COMESA has since been a key participant in the design of the implementation strategy and roadmap highlighting specific strategic action areas (SAAs). This strategy was launched in January 2015 by the African institutions together with other stakeholders, on the margins of the 24th AU Summit of Heads of State and Governments in Addis Ababa, Ethiopia. I personally attended the official launch event. I firmly believe that, in seeking to achieve the 2025 Vision on CAADP, the Malabo Declaration will require the participation of key stakeholders such as regional economic communities (RECs), private sector and non-state actors and our development partners, both technical and financial. COMESA will further facilitate the review of existing and new generational National Agriculture Investment Plans (NAIPs) to ensure that they align to Malabo. While the AU provides the framework for implementing decisions, we, as RECs, coordinate and facilitate implementation in our member states and the region. As COMESA we were glad to have also been part of the recent development of the Programme of Works that seeks to unlock, in more specific terms, the Malabo implementation strategy and roadmap. This was finalised in Parys, South Africa at the end of February 2015. Indeed, one of the targets as contained in the Malabo Declaration is a focus on tripling intra-African agriculture trade by 2025. To achieve this, COMESA will focus in the next ten years on strengthening its trade facilitation role and look at concretely advancing realisation of the Grand Free Trade Area (FTA) under the Tripartite Framework involving EAC, SADC and COMESA. As you know it is the mandate of our region to enhance integration through better inter- and intra-regional trade and investment. 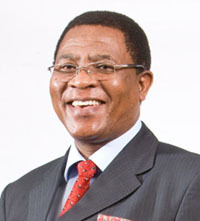 Some of this facilitation includes: harmonisation of trade policies and their implementation; harmonisation of Sanitary and Phyto-sanitary (SPS) regulations; establishment of ‘one-stop’ border posts; implementation of the Green Pass; energy and infrastructure development; and support to SMEs through the COMESA Simplified Trade Regime (STR). These are but a few of our many initiatives. Furthermore, COMESA seeks to promote trade corridors while looking to sustain investments through public private partnerships (PPPs). I am particularly keen to see smallholder farmers receiving support towards graduating into agro-processing and value addition, as opposed to being simply producers of raw agricultural commodities. On-farm processing can be facilitated by the public sector through provision of infrastructure such as electricity or alternate energy and good road networks linking rural farmers to markets. To promote agriculture trade, COMESA will continue to address the impact of climate change as well as non-tariff barriers to agriculture trade such as SPS issues, and to link smallholder farmers to regional markets. Through our specialised agency, ACTESA (the Alliance for Commodity Trade in Eastern and Southern Africa), we will support smallholder farmers to increase their production and productivity and the use of fertilizers; and enhance their access to markets. Under the Regional CAADP Compact, COMESA will elaborate programmes aimed at advancing trans-boundary commodity value chain platforms. Currently, we are elaborating a dairy value chain platform involving Rwanda, Uganda and Kenya. We shall select another three to four other commodities in the region, going forward. FR: What opportunities does regional action provide for adding value to action already being undertaken by COMESA member states at the national level in line with CAADP? 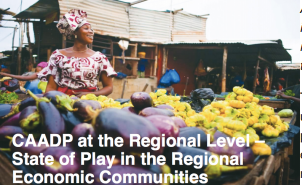 What specific benefits can such regional action provide to COMESA member states? SN: The COMESA Regional CAADP Compact was signed on November 14, 2014 in Kinshasa, DRC, with the explicit aim of tackling actions and initiatives that are most effectively dealt with at the regional level in order to strengthen national level efforts. COMESA, in partnership with other institutions including the European Centre for Development Policy Management (ECDPM), has launched a process of elaborating projects within the context of the Regional Compact. This will be our focus going forward – to ensure that we strengthen our national CAADP processes for better results and impact. Among the various opportunities that regional action provides is the availability of a much larger market for all agricultural-related goods and services. The COMESA market has a population of approximately 500 million, and is currently growing at 3% per annum. The combined GDP of our member states is US$500 billion. Now, at member states’ current stage of development and with their limited domestic market size, cultivation of regional export markets is a critical pathway to industrialisation and development for several of our countries in the region. For example, the demand for food in Africa’s urban and regional markets is estimated to grow from around US$50 billion in 2010 to US$150 billion within 25 years. The cost-effectiveness of regional food supply chains will be based on the efficiency of being able to move commodities from surplus production areas, both across borders and within countries, to consuming areas. To enhance trade in staples, COMESA is promoting a regional approach to food security by encouraging infrastructure development and harmonised policies that enable the free flow of food staples from surplus to deficit areas. Furthermore, regional action provides a huge incentive and opportunity for increased attraction of foreign and local investment. Lack of affordable, long term financing has been a chronic impediment to the sustainable growth and development of the agriculture sector in COMESA. In this regard, the decision to establish a competitive COMESA Common Investment Area (CCIA) was proposed in 1998. The ultimate objective of the CCIA is to promote sustainable economic growth in the region through intra-COMESA trade and investment flows as well as by attracting local and foreign direct investment through the region’s attractiveness to investment. 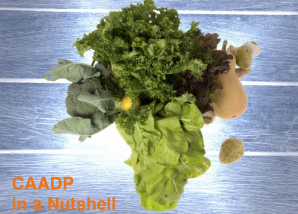 The development of the CAADP-inspired Agriculture Investment Plans at regional and national levels is also designed to increase the flow and coherence of agricultural investment. FR: Considering the slow implementation at national level of some of the regionally agreed policies and protocols for regional cooperation and integration (‘slow domestication’), can regional approaches to food security get better traction in COMESA member states and how? SN: While it is true that there has been slow domestication of some of the regionally agreed policies and protocols, there have been some positive results in countries that have hastened the domestication process. Due to the importance of food and nutrition security, regional approaches to improve the situation have long been appreciated. Currently, the CAADP framework, which is a continental approach, has been embraced by a large number of African countries. In the COMESA region, 14 of the 19 member countries have already actively embraced this framework. The experience of country-level implementation is already giving excellent feedback to the implementation of the regional process. We need to build upon the current successes and the momentum to ensure greater returns. The ‘how’, is an important issue. COMESA will continue to use a partnership approach involving national, regional and international stakeholders to ensure coherence in design of programmes and in implementation. Internationalisation, as it were, of the NAIPs through broadening of issues to the regional arena, will continue. FR: What steps is COMESA taking to avoid incoherence and foster synergies between regional CAADP-related initiatives and national level actions? Given some COMESA member states are also EAC member states, should COMESA and EAC better coordinate their regional CAADP-related initiatives? SN: CAADP was endorsed in July 2003 by the African Union Heads of State in Maputo Mozambique. 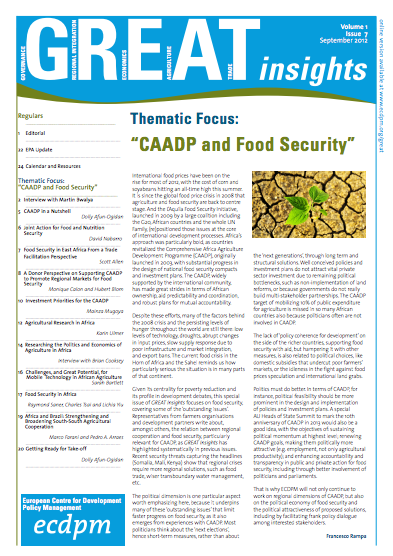 Since inception, CAADP implementation has been at both national and regional level. In order to avoid incoherence and foster synergies between regional and national level actions the two processes have been organically and explicitly linked. As earlier indicated, the Regional CAADP Compact is expected to facilitate implementation of programmes and projects that are trans-boundary in nature – that is, most effectively dealt with at regional level to strengthen the national level agenda. The Regional CAADP Compact adds value to National Compacts of member states by supporting regional actions that cannot effectively be undertaken by individual countries. Member states were the largest constituency of stakeholders during consultations for priority setting of the Regional Compact. In conjunction with other regional actors, all COMESA member states validated the Regional Compact in September 2013, in Lusaka, Zambia. Through this inclusive, consultative and country-led process, COMESA has ensured that the National and Regional Compacts compliment rather than undermine each other. Concerning the second question, indeed four of the five EAC member states are also COMESA member states. Due to this level of cross membership, the EAC has been an active participant in the COMESA CAADP regional processes to avoid duplicity of efforts. Furthermore, when COMESA is providing technical, financial or other support to our member states, cognisance is taken of EAC’s efforts in the countries. This is to ensure a coordinated approach in facilitating CAADP implementation in our respective countries and to maximise impact. In the same spirit of collaboration and coordination, tripartite negotiations involving COMESA-EAC-SADC were launched in June 2011. The aim is to establish a Grand Free Trade Area encompassing these regional organisations. The COMESA-EAC-SADC FTA will cover 26 countries with an estimated population of 700 million and a combined GDP of over US$1 trillion. FR: What role do you see for inclusive multi-stakeholder partnerships, such as PPP platforms for regional value chain development, in promoting food and nutrition security and sustainable agricultural development in the COMESA region? How can such partnerships promote the interests of the region’s smallholder farmers and women farmers? SN: COMESA recognises the critical role of the private sector in promoting food and nutrition security. Multi-stakeholder public-private partnerships will foster the necessary policy dialogue aimed at improving the policy formulation process in COMESA, as well as institutional linkages and policy reform. Often such platforms bring to the fore the needs of the most vulnerable of society such as smallholder farmers, including women. These platforms would ensure effective agenda setting mechanisms involving the public sector, civil society, non-state actors, farmers themselves, and the private sector in general. A regional value chain approach helps in reducing barriers to entry and formalises the benefits accruing to free trade initiatives. There is need for well-organised multi-stakeholder partnerships to mainstream regional programme development. COMESA values the current multi-stakeholder partnerships that are involved in the development of the CAADP Regional Investment Programmes in Agriculture. These include actors from the regional dairy value chain in Kenya, Uganda and Rwanda. 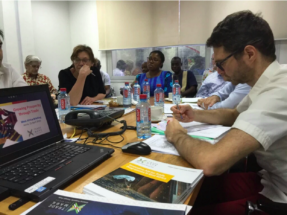 FR: What is the specific role donors should play in supporting the regional CAADP Investment Plan? Can companies from donor countries like those in Europe also support COMESA in the promotion of intra-regional trade in agricultural foodstuffs? SN: The COMESA Regional CAADP Compact identifies priority areas of focus for investment in the COMESA region. We are thankful for the support from all stakeholders who accompanied us throughout the development process up to the signing of the COMESA Regional CAADP Compact. 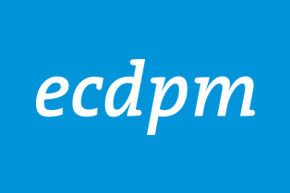 We are also thankful to ECDPM for your contribution to this process. We do not take the support and goodwill, particularly from development partners, for granted. At COMESA, we believe that promotion of private sector investment in all key priority areas in the region will contribute to sustainable implementation of the Regional CAADP Investment Programmes. We welcome development partners’ support towards building capacity for implementation of our regional programmes aimed at promoting private sector investment in agricultural value chains as a catalyst for tripling intra-regional trade as well as economic growth and transformation. Within the principle of mutual accountability to actions and results, development partners will remain indispensable partners to hold us accountable to the commitments and targets we set for ourselves. With regard to your other question, we also welcome corporations from donor countries in Europe to support COMESA in the promotion of intra-regional trade in agriculture and importantly to invest in the region. In this globalised economy, and in the context of benefiting from economies of scale, European investors could establish synergies with the private sector in the COMESA region. Our Regional Investment Centre and the COMESA Business Council are ready to facilitate this. I believe that in the wake of the global crisis, synergies have helped multinational companies to survive through channeling their investments to other regions where perceived risks are low. In the past ten years, seven of the top ten fastest growing economies in the world are in Africa. Three of these are in COMESA: Ethiopia, Democratic Republic of Congo and Zambia. According to the World Bank & IFC Doing Business 2012 Report on the ease of doing business within borders in Africa, six of the ten best African countries are also in the COMESA region: Mauritius, Rwanda, Seychelles, Zambia, Uganda and Kenya. We encourage companies from Europe to explore investment opportunities, particularly in agricultural value chains and foodstuffs in the COMESA region. 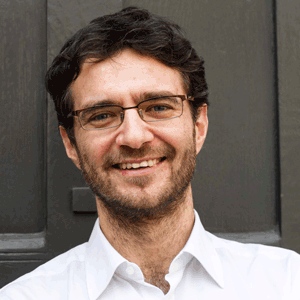 This interview was conducted by Francesco Rampa, Head of Food Security Programme, ECDPM. 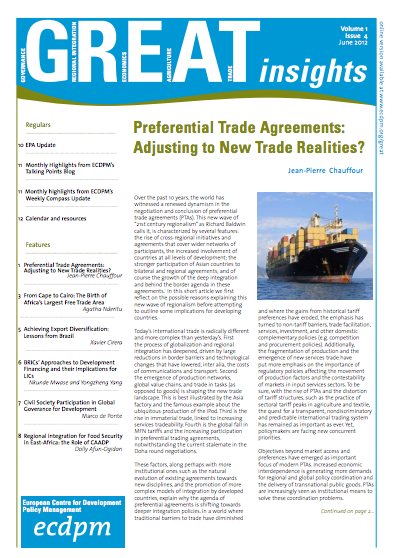 This article was published in GREAT insights Volume 4, Issue 2 (February/March).